Mera La and Amphu Lapcha Pass trek is one of Nepal’s challenging off-the beaten-path trails that offers extraordinary Himalayan scenery. The trek starts and concludes at the popular mountain airstrip of Lukla, in the Everest region of Nepal. The trail goes along the remote and wilderness mountain area, dramatic passes of Mera La (5,415m/17,766ft) and Amphu Lapcha (5,800m/19,029ft) or Amphu Labtsa making a circular loop back through the Sagarmatha National Park. 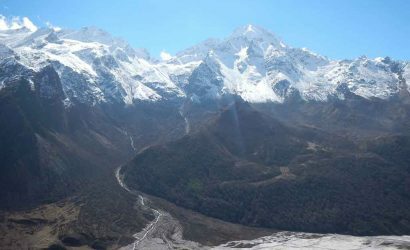 The trek then connects with the Khumbu region at Chhukung. The trek to Mt. 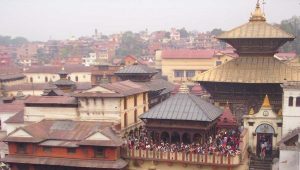 Everest Base Camp and Kalapatthar is tremendous and visit of the pristine Sherpa villages and monasteries makes the trip memorable over a lifetime. This trip requires a well-supported crew and great stamina because of the high altitude and its remoteness. After crossing the Mera La pass, we proceed further towards Amphu Lapcha pass dropping down into the uninhabited Hinku valley situated to the east. 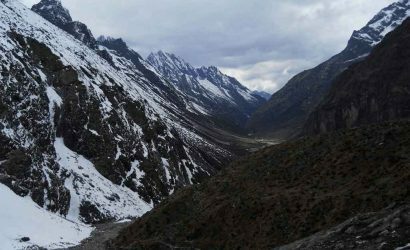 The upper Hinku (Honku) section is truly a wild valley where it is very unlikely to meet other trekkers. The valley is high and open, fringed with broad moraines and sharp white peaks and a wonderful place to camp. The glacial lakes and views of Chamlang (7,319m/24,013ft) and Baruntse (7,129m/23,390ft) are significantly attractive here. The crossing of Amphu Lapcha pass is technically more demanding and offers breathtaking views to the adventurous trekkers and climbers. 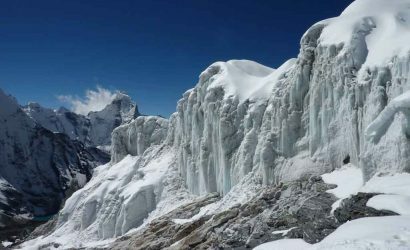 The Amphu Lapcha pass is ascended with the protection of fixed ropes over straightforward ice-fall and the descent requires a short abseil to a broad snow terrace. 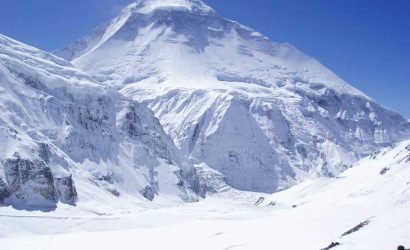 The pass is tricky owing to steepness although it is at lower altitude than Mera (6,654m/21,831ft) and Island Peak (6,160m/20,211ft). 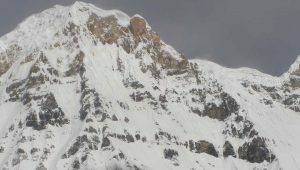 There is a possibility of combining Mera or Island Peak climbing with this trek. 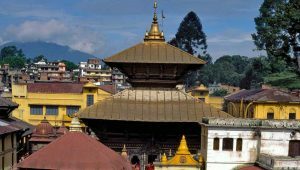 Fly Kathmandu to Lukla (2,840m/9,318ft) and trek to Chutanga (3,050m/10,007ft). Trek Chutanga to Tuli Kharka (4,320m/14,173ft) crossing over Zatrwa la pass (4,855m/15,929ft). Trek Tuli Kharka to Tashing Dingma (3,650m/11,975ft). Trek Tashing Dingma to Kothe (4,095m/13,435ft). Trek Kothe to Thangnak/Tangnag (4,350m/14,272ft). Trek Tangnag to Khare (5,100m/16,733ft). Rest day at Khare for acclimatization. Trek through Mera la Pass (5,415m/17,766ft) and Camp. Trek to Hinku/Honku Valley (5,220m/17,126ft). Trek Honku Valley to Panch Pokhari (4,500m/14,764ft). Trek Panch Pokhari to Amphu Lapcha (South) Base Camp (5,200m/17,061ft). Trek through Amphu Lapcha pass (5,800m/19,029ft) to Chhukung (4,730m/15,519ft). Trek Chhukung to Lobuche (4,910m/16,109ft). 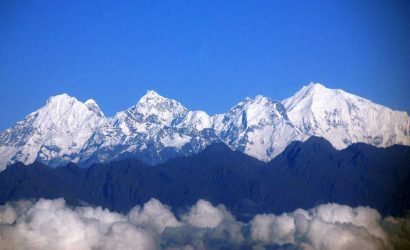 Trek/Climb Gorakshep to Kalapatthar (5,545m/18,192ft) and return trek to Thokla (4,620m/15,158ft). Trek Thokla to Pangboche (3,930m/12,894ft). Trek Pangboche to Namche Bazaar (3,446m/11,306ft). Trek Namche Bazaar to Lukla (2,840m/9,318ft). Fly Lukla to Kathmandu (35 minutes). Necessary equipment including high mountain Tents, Ropes, Mattresses, etc. Personal equipment that may require for high passes such as Ice-axe, Crampons, etc.